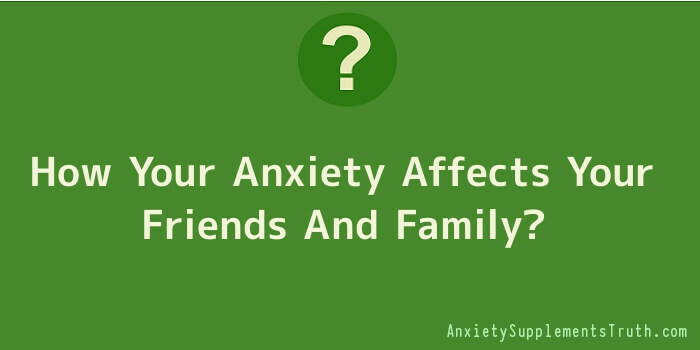 Many Anxiety sufferers have never told anyone about their problem. If you feel ashamed or embarrassed about having Anxiety you might feel quite unable to talk to anyone about it. You may also feel that you’ll be labelled forever as someone who was mentally ill, that you won’t receive any sympathy, or that you’ll be forced to try treatments that you don’t really want. Even if you haven’t told anyone, your friends and family are being affected by your illness. They may not know why you keep turning down invitations, or refuse to go on holiday with them, but they do know that something is preventing you. People are naturally curious, and they’ll wonder why you behave as you do. They may decide that you’re just shy, or guess that there’s some sort of problem. They may also come up with explanations that are way off beam – such as thinking you’re unfriendly, or consider yourself too good to mix with them. Did it upset you to read that? If only people knew what you’re going through, then they’d have more sympathy, surely? Or would they judge you as weak, or pathetic? Struggling to keep your illness a secret adds greatly to the stress of Anxiety, so does worrying about who to tell, and how. Only you can decide what is right for you, but many people have reported the great relief they felt when they finally confided in someone. Many sufferers tell only one person, usually their partner or a family member. If they need a lot of support from that person they may then start to feel guilty about it, or perhaps resentful that the person isn’t doing enough to help. It can make more sense to tell a few trusted people so that they can share the helping tasks. You may find that one person has a soothing presence and you enjoy their company, while another is helpful in a practical way. It’s important not to let your friends and family become part of the problem. If they always do shopping for you, or check the house for spiders, or let you travel in the front seat of the car, then they are helping to maintain your Anxiety. No doubt they are busy people, and find it easier to go along with your immediate needs rather than take the time to help with recovery. With the best will in the world, they are doing exactly the wrong things. Of course temporary help, while you work on your recovery, is quite a different matter. People with OCD do often admit to their difficulties, because they need help with their OCD. Sometimes they need help to complete their rituals, and sometimes they have a compulsive need to ask for reassurance. If you have OCD, you may have already involved your friends and family, even if it’s just that they have to tolerate the extra time you need to do everyday tasks. They may also be obliged to live in a certain way (e.g. always wiping door handles after touching them) or may be involved in giving reassurance. Whatever kind of help you have, you will at some point need to let go of it and take responsibility for yourself. Like every aspect of recovery, it can be planned as a series of goals aimed at gradually reducing your need for other people to support your Anxiety behaviour. For a few people their Anxiety becomes so extreme that they need to be cared for by another person. This is a tough role and carers often become exhausted, while the person they are caring for has yet another worry – what happens if my carer can’t carry on? This is an extreme scenario of course, but it does give a tremendous motivation for undertaking recovery. Even someone who’s Anxiety has become this bad can start a recovery program – there is no situation so bad that it can’t be turned round by slow steady repeated steps towards carefully chosen goals. It’s best to tell your carer what you are planning to do, so that you can work through the program together. You may need to make changes in your daily routine, or ask for extra patience and understanding while you work on your goals.